WASHINGTON (Reuters) - The head of the U.S. House of Representatives Intelligence Committee said on Sunday he is investigating whether former spy agency contractor Edward Snowden had help from Russia in stealing and revealing U.S. government secrets. "I believe there's a reason he ended up in the hands - the loving arms - of an FSB agent in Moscow. I don't think that's a coincidence," U.S. Representative Mike Rogers told the NBC program "Meet the Press," referring to the Russian intelligence agency that is a successor of the Soviet-era KGB. Snowden last year fled the United States to Hong Kong and then to Russia, where he was granted at least a year of asylum. 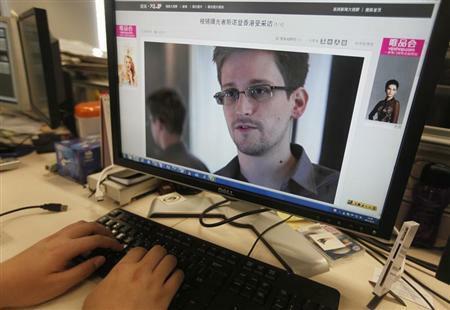 U.S. officials want Snowden returned to the United States for prosecution. His disclosures of large numbers of stolen U.S. secret documents sparked a debate around the world about the reach of U.S. electronic surveillance. Rogers did not provide specific evidence to back his suggestions of Russian involvement in Snowden's activities, but said: "Some of the things we're finding we would call clues that certainly would indicate to me that he had some help." Asked whether he is investigating Russian links to Snowden's activities, Rogers said, "Absolutely. And that investigation is ongoing." Senator Dianne Feinstein, who heads the Senate Intelligence Committee, said on "Meet the Press" that Snowden "may well have" had help from Russia. Feinstein said Snowden gained employment at the National Security Agency "with the intent to take as much material down as he possibly could." On the ABC program "This Week," U.S. Representative Michael McCaul, chairman of the House Committee on Homeland Security, also expressed his belief that Snowden had foreign help. "Hey, listen, I don't think ... Mr. Snowden woke up one day and had the wherewithal to do this all by himself," he said. "I personally believe that he was cultivated by a foreign power to do what he did," McCaul said. Asked whether he thought Russia was that "foreign power," McCaul said, "You know, to say definitively, I can't. I can't answer that." Rogers indicated that the nature of the material that Snowden obtained suggested foreign involvement. "When you look at the totality of the information he took, the vast majority of it had to do with military, tactical and operational events happening around the world," he told the CBS program "Face the Nation." Michael Morell, the former deputy CIA director, said he shared Rogers' concern about what Russian intelligence services may be doing with Snowden. "I don't have any particular evidence but one of the things I point to when I talk about this is that the disclosures that have been coming recently are very sophisticated in their content and sophisticated in their timing - almost too sophisticated for Mr. Snowden to be deciding on his own. And it seems to me he might be getting some help," Morell said on "Face the Nation." Snowden told the New York Times in October he did not take any secret NSA documents with him to Russia when he fled there in June 2013. "There's a zero percent chance the Russians or Chinese have received any documents," Snowden told the Times. In remarks aired on Sunday on ABC's "This Week," President Vladimir Putin discussed Snowden's freedom of movement in Russia and that the American would be free to attend the upcoming Sochi Winter Olympics. "Mr. Snowden is subject to the treatment of provisional asylum here in Russia. He has a right to travel freely across the country. He has no special limitation. He can just buy a ticket and come here," Putin said.